City planners today at the Seattle Department of Planning and Development released a preliminary map of areas where marijuana farms, processors, and stores may be located within city limits. According to the Seattle Times, the areas have not yet not been approved by the state Liquor Control Board, which is charged with implementing the legalization of marijuana after Initiative 502 passed last year, but is based on rules the city council is considering. Most of the locations appear to be in industrial areas with few in residential and commercial districts, and the map indicates tighter restrictions on marijuana businesses than other recreational drug sales. The LCB recently announced its approval of updated rules that limit state-licensed retail pot stores to 334 and cap statewide production at 40 tons per year. In efforts to control the recreational market, growing facilities can be no larger than 30,000 square feet and entities cannot own more than three licenses in each of the growing, processing, and retailer categories. The rules also allow for outdoor and greenhouse growing, though such operations are expected to be mostly in eastern Washington. Allocation of pot shops in each county and larger cities was proportioned by population, with Seattle limited to 21. Shops cannot be within 1,000 feet of elementary and secondary schools, playgrounds, recreation facilities, child care centers, public parks, public transit centers, libraries, or game arcades. Significantly, the updated rules now determine 1,000 feet not as a direct line but the distance traveled on foot, and the additional allowed areas are indicated in the purple areas on the map above. In addition to the state rules, the Seattle City Council is preparing more restrictions that prohibit marijuana businesses in residential zones, most commercial zones, and many historical and neighborhood districts. 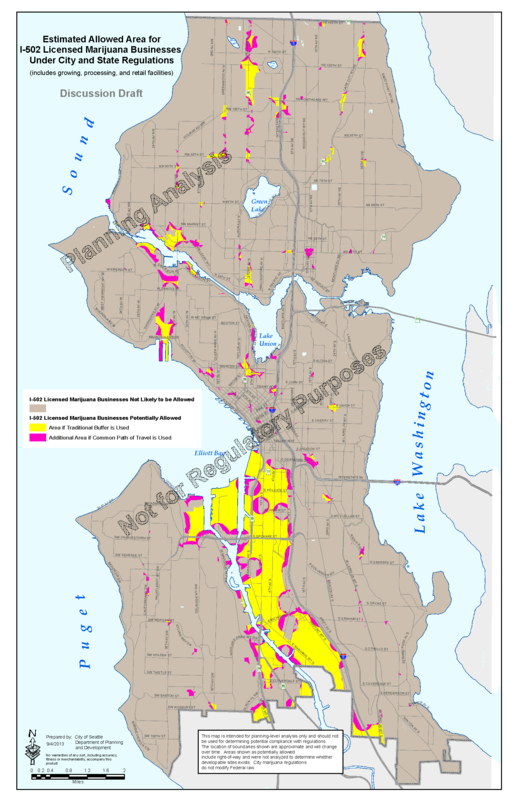 The result is the yellow areas on the map that are concentrated in the Sodo, Interbay, and Fremont industrial areas with scattered pockets to the north and east. Seattle’s rules will also limit growing operations to 10,000 square feet on rooftops or indoors. Though marijuana has been proven to be less harmful than both tobacco and alcohol, socially and physically, the stringent limits on pot shops is likely due to the unknowns associated with a legal market and to appease the long arm of the federal government. While Colorado voters also passed Amendment 64 last year to create a recreational market, and a number of other states have decriminalized pot or permit medical prescriptions for pain relief, federal law still defines marijuana as a Schedule 1 illegal substance. Concerns about federal intervention were slightly relieved when the U.S. Department of Justice announced it will allow Washington and Colorado to continue their legalization efforts if they follow eight public safety guidelines, which include preventing distribution to minors, drugged driving, growth on public lands, and revenue for criminal organizations. Washington’s rules support these policies. Even so, the location of pot businesses is much less lenient than that for alcohol and tobacco sales. In 2011, voters’ approval of Initiative 1183 ended the state’s monopoly on liquor stores and allows grocery stores at least 10,000 square feet in size to sell hard alcohol with no restrictions on proximity to places frequented by minors; by 2012, there were 4,822 grocery stores with liquor licenses statewide, up from 166 state-owned stores. Similarly, there are no restrictions on the location of tobacco sales. It’s likely that many schools, parks, and other youth destinations will be closer to grocery and convenience stores that sell alcohol and tobacco than marijuana shops, which questions reasoning behind the policies. It’s possible the restrictions will be lightened as the market develops, however. The Liquor Control Board’s rules are anticipated to become state law in mid-November with marijuana sales likely starting early next year. For more information, visit the LCB’s page on I-502 implementation. This entry was posted in Agriculture, Government, Industrial, Land Use, Parks, Policy, Schools and tagged department of justice, department of planning and development, distribution, farming, federal, growing, I-502, Initiative 502, land use, laws, map, marijuana, minors, parks, pot, pot shops, production, rules, sales, schools, Seattle, Washington, zoning. Bookmark the permalink. Well there’s 2 initiatives I wished I hadn’t voted for as they now make me uncomfortable…voters’ remorse, or senior citizen don’t change anything-itis…call it what you want. But I suppose they would have passed anyway with or without my vote. these zones are ridiculous, you aren’t going to stop black market by putting it so far out of peoples way. No shops in capitol hill bc of PARKS? People will just buy it on black market and smoke it in the park. Schools make sense but the parks is just ridiculous. It is a good people voted for, its like saying you are only going to put McDonalds or Bars in the run down industrial ares, why so different for weed? Good job city council, good job.